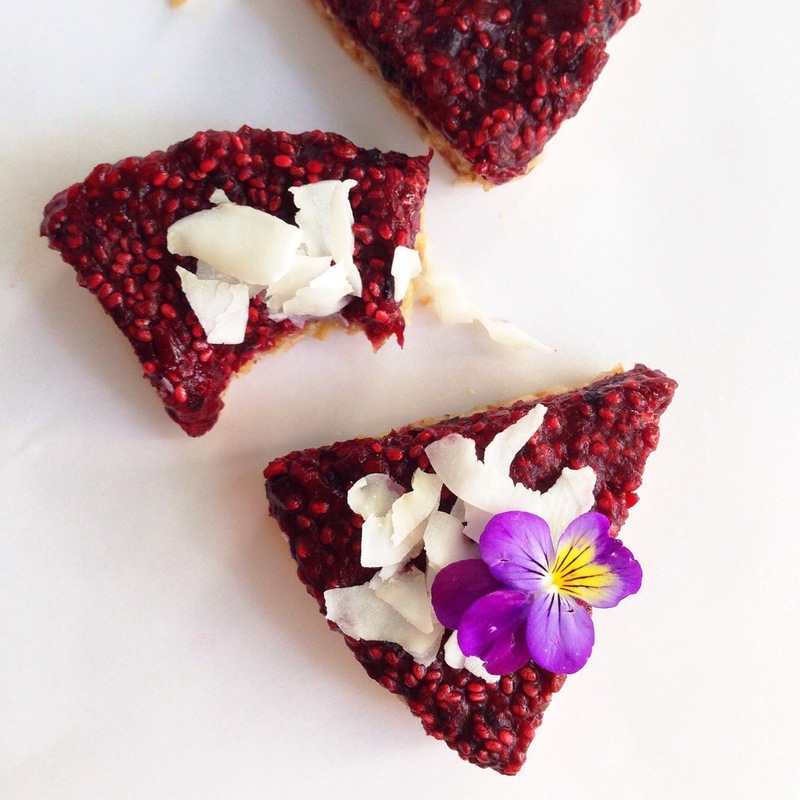 Raw Chia Berry Tart. | Eat More Plants. How do food photographers not eat all the food before they’re done shooting? I start with a whole pie and end up with three pieces by the time I get a picture I like. 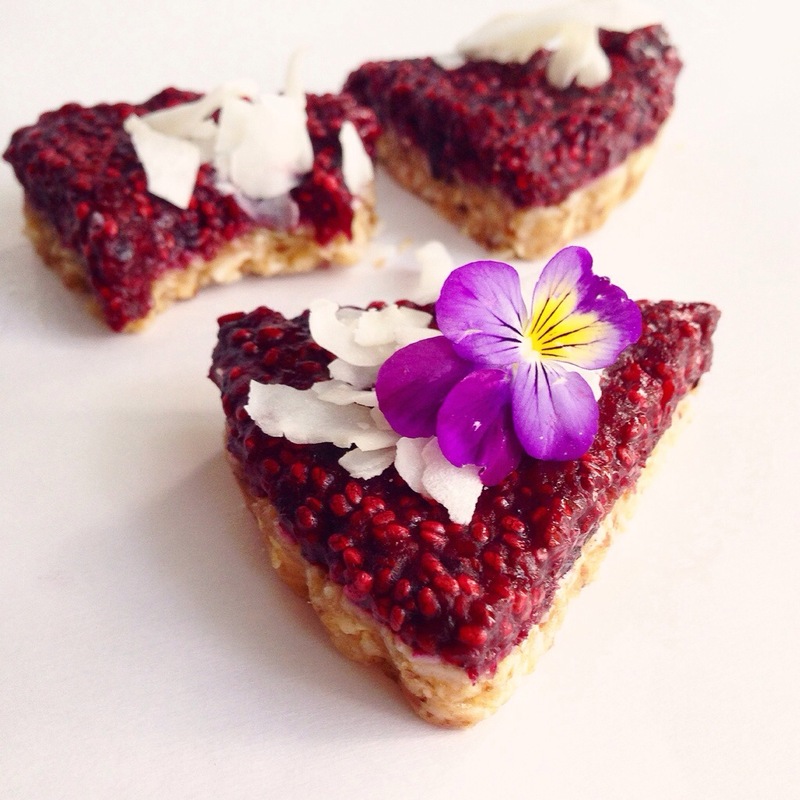 I make so many of these raw tarts; sometimes cashew cream filling, sometimes berries, sometimes both. I usually just throw in what I have on hand but this time I actually took note of my measurements. This tart reminds me of a Lara bar with jam on top. Makes one 9inch tart or three 5inch tarts. Blend or process coconuts and cashews until crumbly and incorporated together; a few minutes at most. Add the dates and the salt. Blend until mixture is uniformly crumble and holds together when you squeeze a ball of it in your hand. Press firmly into the bottom of a springform pan or a tart pan with a removable bottom. Set aside until filling is ready. 2 c berries, any kind – I used a mix of cranberries, blackberries, blueberries and raspberries. Basically all the leftover berries I had from making smoothies. If you’re going to use frozen berries, let them thaw in a strainer before blending. Blend berries and dates until smooth. Add chia seeds and blend for 30 seconds. Mixture should be thick enough to scoop out of the blender and not pour. Spread the filling evenly over the top of the crust. Will keep in the fridge for 5 days. Yum! They look fantastic and I love the deep red color. Thank you for your recipes! It looks so delicious and I want to try to make this cute tart. Ｉhave questions. 2t chia means 2 table spoons or tea spoons ? and do I need to soak chia before I use? Please tell me thanatology you!